Beat 102-103 is ramping up its support of Irish Music by partnering with the Irish Songwriter’s Association for #PLAYIRISH. The initiative is aimed at working with radio stations to increase the amount of Irish music heard by radio listeners in Ireland. Beat 102-103 was recently honoured by IMRO with a national award, recognising the station’s ongoing support for Irish music creators. This month, Beat has expanded its promotion of #PLAYIRISH to include more cross-platform support which complements the station’s already substantial on-air support of the artist and song. #PLAYIRISH is about elevating smaller artists with great songs. Head of Station Sound at Beat 102-103 Niall Power and IrishBeats presenter Rob O’Conner both listen to lots of new Irish music sent to them each week. They then choose a new song by a lesser known Irish artist to support and elevate. 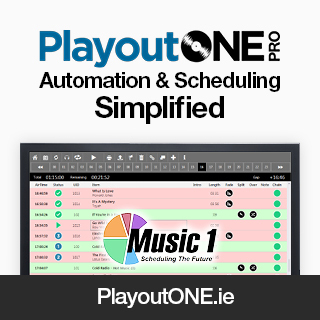 This is achieved through airplay on the station’s dedicated home-grown show called IrishBeats, along with primetime daytime airplay, showcasing the song on Beat Breakfast. The track gets played at the same time every day for a week. Recent #PLAYIRISH artists on Beat have included Brave Giant, Elmore, Cathal Flaherty and Fallen Lights. Beat’s Head of Station Sound Niall Power says: “It’s great to do our bit towards creating a future Hozier/Kodaline/Picture This. It’s so important to support good Irish music early in their careers, starting that all-important relationship with the artist/management/label. “We’re really delighted that #PlayIrish is so well received by our listeners and we’re hoping our extended digital support will encourage new listeners to sample some great new Irish music. Along with the radio and online support, the live element is important too and we love providing exclusive access to rising Irish music stars through our listener parties across the South East. “We also give Irish artists the opportunity to perform to thousands of people at our annual Beat On The Street events during the summer. Last year in Gorey, Co. Wexford, we featured Chasing Abbey, The Academic and John Gibbons – all of whom signed major international record deals in 2017”.